Beautiful mountain views are yours while staying in this recently remodeled, attractively furnished home. You'll enjoy a stone fireplace, huge dining room table and free WiFi internet access. The family room, dining room and kitchen are joined for a spacious open floor plan with vaulted ceilings. Just 3 steps from the family room door you'll find our private, 5 person, 24 jet hot tub which is located on the 700 sq ' wrap around deck. Take in the magnificent star filled sky while soaking your cares away. There is seating and dining for 9 on the deck as well as a Weber gas grill and, of course, that awesome view. Whip up a feast in the kitchen which has stainless steel appliances. You'll find it very well stocked with dishes, glassware, silverware, cooking utensils, pots & pans, serving plates & bowls and small appliances as well as coffee, tea, sugar and a wide array of seasonings. There is plenty of room for your friends or family reunion, as there are four bedrooms and three and a half bathrooms; 2,000 square feet total. The large master suite has vaulted ceilings, a walk-in closet and a private bathroom. Downstairs are two bathrooms and three bedrooms each with queen beds, two have walk-in closets and all have flat-panel LCD TV's. We have a highchair, portable crib, outlet plugs, night light, some cabinet locks,a baby gate, and door alarm available for complimentary use by our youngest guests. Winter brings the opportunity to hit the slopes for fabulous powder runs at world class Vail and Beaver Creek Resorts along with boutique areas Bachelor Gulch and Arrowhead. All four are located within 6 miles of this rental home! Ski, snowboard, snowshoe, snowmobile, snow bike, tube, or ice skate. The choice is yours in our winter wonderland. Visiting Summit County resorts is also convenient, Copper Mountain is 30 minutes away, Keystone and Breckenridge about an hour. The home is served by the local ECO bus line. Using the ECO (Eagle County) bus service, you can ride to Vail (11 Minutes) and the base of Beaver Creek (7 Minutes). Kids 18 and under are free, adults are $4. The bus stop is about 2 blocks away. This property is conveniently located in the Community of EagleVail, a residential golf course community, just three miles east of Beaver Creek and seven miles west of Vail. With snow the golf course becomes a maintained cross country ski and snowshoe trail for your use. Local facilities include a community swimming pool, two golf courses, driving range, free putting & chipping green, free tennis and pickle ball courts, pocket park playgrounds and national forest trails. Additionally, the home is two blocks from the Eagle River (popular for fly fishing & kayaking). Enjoy bike touring on the trail system connecting Vail, EagleVail, Avon and Edwards along the Eagle River and Gore Creek. This community is also located close to the towns of Avon, Edwards & Minturn, home to dozens of shops, groceries, and restaurants. Wonderful outdoor concerts are held at Ford Amphitheater adjacent to the award winning Betty Ford Botanical Gardens in Vail. There are several farmer's markets in the area during the summer and early fall. Edwards has theirs on Saturday, Minturn on Saturday, and Sunday is the largest of them all in Vail. We are also a great deal for your summer/fall family gathering in Vail or Beaver Creek! We have three touring bikes, three sets of golf clubs (a $40 savings over club rental), and day packs for your use when hiking or to pack a picnic for a concert. There are also basic tennis rackets you are welcome to use. Please email us with your contact information. This is a NO Smoking home. Sorry, NO pets. Judd, Monica, Jenica & Garrett Watts. While Denverites for 30+ years, Judd grew up north of Chicago and Monica was raised in Minnesota and Idaho. Judd is a Global Alliance Manager for a big data storage company. He's currently the President of the EagleVail POA. Monica manages our home and this property. She is a dedicated volunteer for various service organizations. Jenica is a graduate of Northwestern University and works in Boulder. Garrett's a graduate of Metropolitan State and has the pleasure of working in a museum. We've poured our hearts, time, and effort into making this vacation home perfect for our family, friends, and guests. We love every minute we spend in the Vail Valley and hope you will too. We fell in love with this property the moment we saw it. 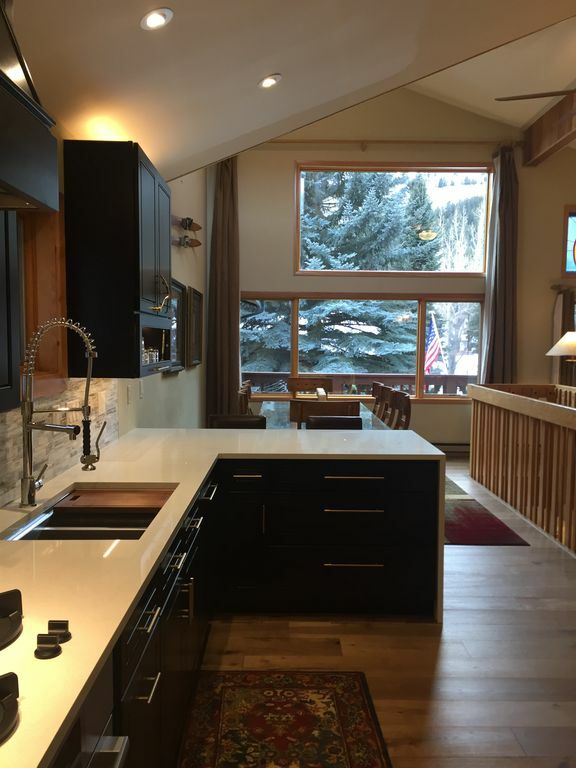 The views of the surrounding mountains are spectacular, all in a residential neighborhood and golf community that just happens to be right between two of North America's top-ranked ski resorts, Vail and Beaver Creek. Aside from being right between Vail and Beaver Creek with great views; this home is across the street from the second fairway of the recently redesigned EagleVail Golf Course. It is 2 blocks from the ECO Bus line to either ski resort and the ECO Bike trial along the Eagle River. This home is just blocks way from the driving range, putting green, both golf courses, swimming pool, tennis courts and national forest trails for hiking. Enjoy our close proximity to all the fantastic recreation in Vail Valley. There are a multitude of festivals, concerts, and events in the area many of which are free. It is great to hit the kitchen and whip up gourmet meals to enjoy on our deck while taking in the great view. We also enjoy eating our way through the fantastic restaurants in the area. Wrap up your day soaking away the pleasant ache of your daily adventures in the hot tub. toilet, shower, Master bath, separate sink area. toilet, combination tub/shower, Heated floors, marble counter, variable shower spray, tub. toilet, shower, Remodel w/spa shower, granite counter, heated tile floor. Bathrooms 1 and 4 are located on the upper level. Bathrooms 2 and 3 are located on the entry level. Electric baseboard; please be mindful that these can get hot and they will burn clothes and linens, etc that are placed on them. Please exercise care to see that items are not in contact with them. Soft, high thread count, quality sheets, down blankets, down comforters and pillows are all provided. Wood burning in the living room with fireplace logs provided along with fireplace tools and a protective grate. On site free parking for 2-3 cars plus a small 1 car garage. Off street parking is only allowed while the snow plow is actively plowing our driveway and parking pad. 1 car garage with opener. The garage can hold a mini van, small SUV (BMW X3 or Hyundai Santa Fe) and sedans, but not large SUV's nor large pick-ups. Nice, thick bath towels, kitchen towels and separate towels for the hot tub are provided. High speed, complimentary and password protected. Open concept Living Room, dining room and kitchen. Door opening to deck and hot tub. Fireplace, 42" smart TV with cable service. Bosch paneled dishwasher, nearly silent, with lighted cycle time displayed on the floor, and third rack. Stainless steel, french door Bosch with ice maker. State of the art PITT, gas 4 burner cook top, integrated into the quartz counter top! Two power, one standard, & one lower BTU burners with room for multiple oversized pots to be used simultaneously. Stainless steel, Bosh electric oven with convection and temperature probe. Lighted interior with full view door. Three racks, one of them telescoping. Cuisinart coffee maker with stainless steel carafe, Keurig k-cup machine, and a coffee grinder. Four slice with frozen and bagel settings. Coffee, tea, flour, sugar and a wide selection of seasonings. We have service for 12 plus additional coffee mugs and glassware, serving plates/bowls & tons of utensils & serving utensils. Plenty of glassware, plus wine, martini and champagne glasses. Fantastic kitchen with 4 gas burners, electric oven w/ convection & probe, french door refrigerator w/ice & drawer freezer, panel dishwasher w/third rack, slow cooker, food processor, waffle iron. Dining room seats 8 at the table, there is also counter seating for 2. Outdoor deck has seating for 9. We have 5 televisions. One 42 inch flat panel smart TV in family room, wall mounted 15 inch flat panel TV's in Queen bedrooms, 40" wall mounted flat panel in master bedroom. We have Comcast cable service to all 5 televisions. Bookshelf stereo with subwoofer, AM/FM and CD with an iPod dock. There's a selection of books in the red hutch you are welcome to read. There are a few youth titles and a few cookbooks as well including one for high altitude baking. We have a large selection of games for a variety of ages. There are also cards, poker chips and a few puzzles. We have numerous DVD's and VHS tapes for your use. There are selections for both adults and children. Small front lawn, smallish fenced side and backyard. Regular touring bikes with helmets are available for your complimentary use. Ride them through the neighborhood or on the bike path that is blocks from our house. They are NOT mountain bikes. Large south and west facing wrap around wood deck with patio furniture for 9 and 2 umbrellas available for shade. The Weber grill and hot tub are located on this deck. Vail-7 miles to the east, Beaver Creek-3 miles to the west, Arrowhead-10 miles west. Breckenridge, Arapahoe Basin and Keystone are each 30-45 minutes away. New community tennis and pickle ball courts are free and available first come, provided there is no lesson taking place. Proper footwear required. Basic tennis racquets for your use in the garage. Heated saline water public pool with lap lanes and water slide. Kiddie pool w/water spray. Gas grills, changing rooms w/lockers and showers. Grassy area and lounge chair seating both available. Our own private 5 Person - 24 Jet hot tub is flanked by pine trees and located on our deck just steps from the family room door. We provide hair dryers in each of the bathrooms, fans, humidifiers, paper products, body wash, shampoo, conditioner and bathrobes. Housekeeping before and after your stay, fenced back yard, sprinkler system. No smoking, no pets allowed. This home is one half of a duplex. Plowing service is provided seasonally. Our family of 3 couples and one toddler loved our Winter stay in this beautiful, Eagle-Vail home. Monica, the owner, was very professional and kind to work with, as well as accommodating. The home was spacious, yet felt comfortable and cozy. Tastefully decorated. Updated, very clean and well stocked with anything you could think of needing. A complete supply of Baby gear was a big help! The owners even welcomed us by leaving a great bottle of wine! In a quiet, golf course neighborhood, and felt very private. Great location with good access to Beaver Creek and Vail, as well as additional activities, great restaurants and shopping in Avon, Edwards and Minturn. We would definitely rent this home again for a future visit! Thank you Monica and Judd! Highly recommended, definitely a gem in Vail’s hit/miss lottery! If your looking for a great place to share memories, that is minutes from skiing at two great resorts, has a wide variety of shopping and dining, you can't go wrong with this home. We had 8 adults that stayed here for one week and enjoyed breakfast every morning with a well stocked kitchen and a dining table that can easily accommodate large groups. Spent the day either skiing or snowmobiling where the conditions were great at both resorts. The hot tub was easy to use and maintain and private. Only dined out once during the week since all of us preferred to relax for the evening which saves considerable time and money when compared to restaurants. If your looking to vacation in this area, this home should definitely be given strong consideration. The end to end experience was great. Working with VRBO along with Monica (owner) was effortless. The home was outfitted ideally for our group of 5 family and friends. Our skiing preference was Beaver Creek...if anyone shares the affection for that mountain, you'll love that it's only a 5 min drive. We had a great time...no hesitation reaching out to Monica for a future rental. This property is one of the best I've stayed at with HomeAway. It's cozy, comfortable, located on a very quiet street, and more than accommodating for our group of guys on a yearly ski trip. The furnishings are top notch, and the kitchen is extremely well appointed with many useful extras. The heated floor in my bathroom was almost too nice (only because I have to do without such a wonderful extravagance when I'm home). It really is a wonderful touch. More than one of our lot were disappointed to have to return to their own home. We didn't use the hot tub or the outdoor grill, but they both looked great. The wraparound deck also looks wonderful, perhaps in warmer weather. We mostly drove to Vail and Beaver Creek, but one of our party took the bus a few times and said it was super easy. Kudos to the owners and the obvious effort put forth into making this a great place. When we come back to the Vail/Avon area and need a place to stay, we'll start our search with this property. We were a group of 6 adults. The house accommodated is perfectly. The hot tub was wonderful especially after a day on the mountain. We used the kitchen, which is fully equipped and updated. All in all this might be our favorite rental ever. Thank you to Monica, the owner, who made everything very easy! Snowshoeing and cross country skiing are also nearby. Local golf courses (2) driving range, chipping & putting green; there are golf clubs in our garage for complimentary use. Live theater (Vilar Performing Arts Center), fly fishing, hiking (there's even a national forest trail here in EagleVail) ice rinks, libraries. In the summer use our touring bikes. Community outdoor swimming pool. Free tennis. Also nearby: Kayaking, ATV rentals and paintball, rafting, horseback riding, fine dining, concerts, movie theaters, bowling, Avon Recreation Center, shopping. Our neighborhood has many pocket parks for children to enjoy. Payment is due 60 days prior to arrival for rentals during holiday periods; Christmas, New Year's, Valentine's Day, President's Week, Easter, and 4th of July. Rentals not meeting minimum stay requirements may be considered on a case by case basis; a mandatory $185 cleaning fee would apply.